We strive to make children of all ages feel at ease and enjoy themselves, so bring the whole family along! 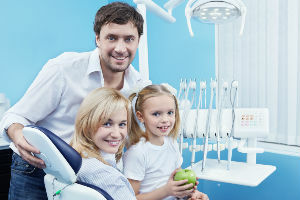 You can rest assured your child will receive the latest advancements in children’s dentistry, delivered with patience, thoughtfulness and compassion. We encourage proper dental care habits in children and enjoy teaching them how to keep their teeth healthy for a lifetime. We look forward to seeing them for their first dental visit when they’re one year old and watching them grow year after year. You can protect your child from dental disease with daily brushing and flossing, regular dental visits and good nutrition. If a child gets dental disease that is not treated, he or she can suffer serious health problems. Healthy eating habits include a diet with plenty of vegetables, fruits and whole grains. Always serve nutritious snacks and limit sweets to mealtimes. Although we now recommend that kids see a dentist for the first time by their first birthday, twice-yearly dental checkups and proper care at home are the keys to ensuring pearly whites throughout childhood. Reddy Family Dental recognizes that a pleasant experience at the dentist plays a big role in a child’s perception of future dental visits. Read a book to your child about going to the dentist. Make brushing and flossing fun. Schedule morning appointments for your child. They are fresh and attentive and not as stressed when it is earlier in the day. 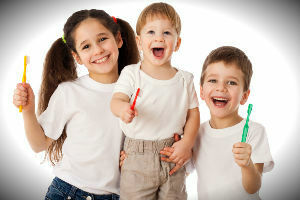 Emphasize the importance of good oral health at home. Make sure your child has regular visits to the dentist. Mention that we have a “TREASURE CHEST” with fun prizes for kids who have their teeth cleaned!! It is normal and age appropriate for a young child to cry, whine, wiggle and not want to be examined. Taking time to discuss things with your child will go a long way to helping you understand where the fear is coming from. Remember that our dentists and staff work with children and have seen many anxious children. One of our goals is to make sure that current and future generations of children grow up without a fear of the dental office. Many of our happy parents say, we are doing just that. Our office is a relaxed and happy place that children love to visit. Whether you have an active six-year-old or a scared three-year-old, we are here to help you. Come meet our staff and see the difference. As soon as your baby’s first tooth appears, schedule his or her first visit. Treat the first visit as you would a well-baby checkup with the child’s pediatrician. It’s best to meet the dentist when your child is having no dental problems. Don’t wait until an emergency comes up. The well-baby checkup helps us to get to know your child’s and your family’s specific needs, so we can provide the best care. A well-baby checkup helps us to get to know your child’s and your family’s specific needs, so we can provide the best care. 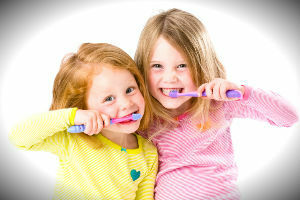 We know that children often don’t do a very good job of brushing their teeth. This applies to adults too. Meticulous brushing often may not reach the deep grooves in the back teeth. This results in bacteria, acids, and plaque formation, which will lead to decay. And once the tooth has decay (cavity), it is damaged permanently and will need a filling. Cleaning your child’s teeth is an important step toward preventing cavities. For babies, after each feeding wipe the baby’s gums with a clean, damp gauze pad or washcloth. This will remove plaque and bits of food that can harm erupting teeth. Sucking is a natural reflex that may make babies feel safe, happy and relaxed. However, in some cases a child’s sucking habits can cause problems with tooth alignment and the proper growth of the mouth. Position your child so you can see into the mouth easily. You might want to sit, resting his or her head in your lap. Move the brush back and forth gently in short (tooth-wide) stokes. Brush the outer surfaces of each tooth, upper and lower. Repeat the same method in the inside surfaces and chewing surfaces of the teeth. Flossing is not easy for a child. An adult should floss a child’s teeth until he or she can do it alone. Most bottled water does not contain fluoride. Children who regularly drink bottled water or non-fluoridated tap water may be missing the benefits of fluoride. Fluorides may be found in toothpastes, mouth rinses and professional fluoride applied at our dental office. It is important for children to get some systemic fluoride to help developing teeth grow strong and healthy. Children living in non-fluoridated communities would benefit from systemic fluoride administration. We at Reddy Family Dental, can review the fluoride status and offer appropriate recommendation. Fluoride is a mineral that is very effective in protecting teeth from decay. When a child’s teeth are still forming, fluoride works by making tooth enamel more resistant to the acid that causes tooth decay. 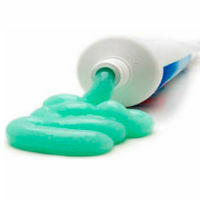 To help prevent children’s tooth decay, the American Dental Association (ADA) Council on Science Affairs (CSA) recommends that caregivers use a smear of fluoride toothpaste (or an amount about the size of a grain of rice) for children younger than 3 years old and a pea-size amount of fluoride toothpaste for children 3 to 6 years old. 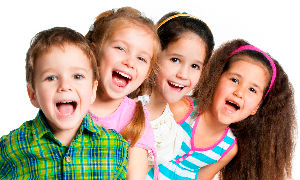 At Reddy Family Dental, all children are administered topical fluoride bi-annually at their cleaning visit.